I'm trying to create a certificate chain using bouncy castle. Then, I use the following code twice. 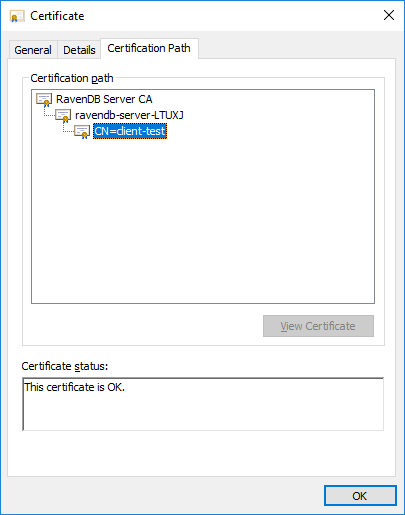 The first time, I generate a "Server Certificate" that is going to be used to generate client certificates. In this case I use the private key of the CA cert and isClientCertificate set to false. Then, I use the same code to generate the "Client Certificate", this time using the private key of the "Server Certificate" and isClientCertificate set to true. 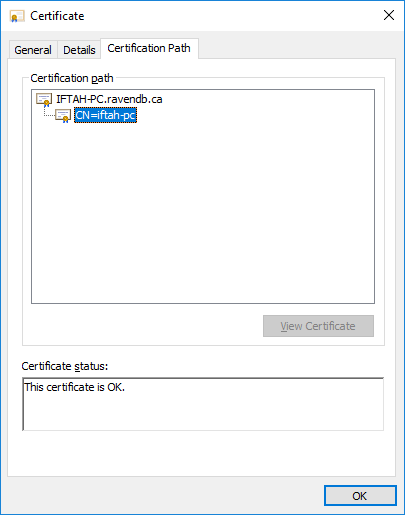 The CA and Server certs look good, including a valid chain. My problem is with the client certificate chain. 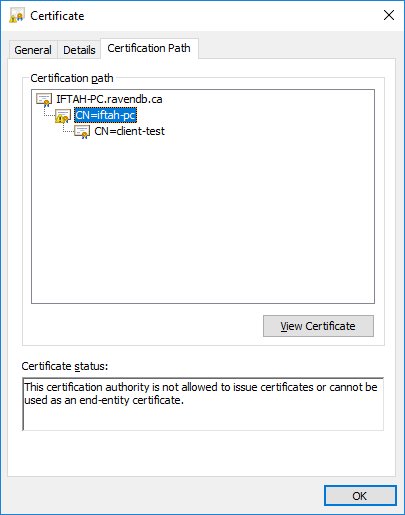 There is a yellow warning on the "Server Certificate" (in the screenshot it's called CN=iftah-pc), it says: This certification authority is not allowed to issue certificates or cannot be used as an end-entity certificate. As far as I can see, I have done things right, in particular: X509v3 Key Usage: critical Certificate Sign, CRL Sign is set properly. Is there anything that I'm missing here? Managed to solve it myself, was missing a basic constraint.